Dating is hard. Meeting people is hard. Finding time to do both is even harder. Luckily, there’s tons of sites and apps out there that make this a little easier. Love is at your fingertips... literally. But with the plethora of options out there, which dating app is best for you? Check out the list below to find out. If your future significant other must love dogs, this app is for you. It helps you connect with nearby dog owners and lets you chat, set up doggie playdates, and see who is already in the area ready for a walk. This app does less “matchmaking” and more “socializing,” so real connections are made in person. Since it’s not made to be a dating site, those who want to find love more organically may be most interested in this. An added bonus: it tracks your walks and exercise stats. Plus, even if you don’t find a special someone, you can make friends and play with more dogs. Win/Win. The name recognition here helps this site boast the most users, so you’re more likely to find a mate based on numbers alone. Users fill out a personality test and include their interests, physical appearance, habits, salary, and several other “deal breaker” category items, so you can be very specific in what you want out of a partner. All that data is bundled in an algorithm that pairs you with another single and includes a compatibility percentage. Plus, unlike other dating services, Match organizes events and activities for members so you can mingle in a low-pressure atmosphere with others. There’s an app too so you never miss a connection. If you love a certain activity and want to find someone to share it with, Meetup is the place to go. From kickball enthusiasts to photography gurus, there’s a group out there that shares your interests and is doing fun stuff regularly. It’s not just for “clubs” though, there’s one time meetup classes and activities in the area (think brewery tours, an entrepreneurship brunch, or group art project) where you may just find someone who catches your eye. Similar to Meet My Dog, this isn’t a dating site and a love connection isn’t guaranteed, but at the very least you can shed the Seattle Freeze and meet others in the area with a shared passion. However, if looking for love is your current hobby – there are a bunch of groups for that (just search for Seattle Singles). If you’re not ready for an in-depth questionnaire/eHarmony type site, and don’t like how casual Tinder is – Coffee Meets Bagel may be right for you. There’s no desktop version available, but the well-designed app is great for people who just want to see who’s out there or find potential dates and meaningful relationships. There’s a brief questionnaire which goes into an algorithm that considers things like age, height, religion, ethnicity, and interests, which ultimately matches users to a limited number of people per day. With those matches, you can only “like” 5 of them in 24 hours, so you consider profiles more carefully than in the swipe right/left mindset of apps like Tinder. Ladies initiate convos first, but only after men have shown interest in them -- so you know you’re chatting with someone who’s into you. 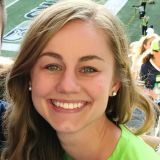 Kaleigh Jurgensmeyer is a Seattle transplant hailing from St. Louis, MO. She graduated from Drury University with degrees in English and writing, and currently contributes home, travel and lifestyle content to Ville. She enjoys traveling, attending concerts and musicals, wakeboarding/surfing, as well as hiking with her dog on the plethora of PNW trails.